Description: It hasn’t been the best week for Jessica McClain. Her mate has been kidnapped by a Goddess hell-bent on revenge — but Jessica is playing for keeps. Because she’s the only female werewolf in town…it comes with its own set of rules…and powers. Aided by two vamps, two loyal Pack members, and one very reluctant human, Jessica must rescue her man while coming to terms with what being a wolf really means. All in a day’s work for a girl. 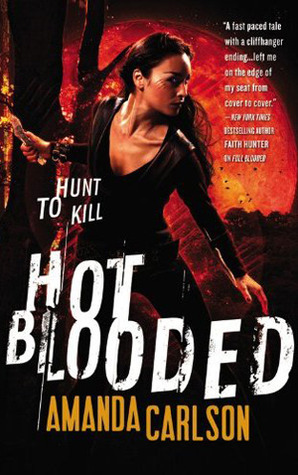 Review: Hot Blooded picked up right where Full Blooded left off. It kind of had to, since Full Blooded ended somewhat abruptly with no firm conclusion. The greatest incentive that I had to give the second book a shot was not so much that I was eager to find out what happens next, but rather that I was granted a free advanced review copy by the Publisher via Net Galley. Once again, Carlson’s concept was good, but the execution was not. For example, the main character, Jess, was maybe a little too powerful. This appeared to be a go-to plot device for the author. The characters were in a no-win situation, no problem! Jessica would mysteriously discover yet ANOTHER inexplicable super power. Maybe I would have bought into it more if there had been some sort of logic behind the powers, but there was not. Another over-used trope in this book was that all of the villains adhered to the Scooby Doo school of pontification. “Well, now that I’ve captured you, let me gloat and fill in details so that you can find a chance to defeat me and escape.” Ugh. The hero characters plainly walked into danger half cocked, I couldn’t help but wonder if it would not have been better for the bad guys & gals to shut up and kill them already! Speaking of half-cocked, I found Jessica to be more annoying in this book. On top of her ridiculously emerging powers, she took head strong to the level of hard headed. Bad decisions made under the guise of being tough are still bad decisions. Rinse, lather, and repeat over and over and the result was one stupid heroine. The one good side of the heroine rushing head first into danger was that it resulted in a lot of action. The battle scenes were not bad at all and quite frankly, they were what kept my attention and allowed me to finish the book. 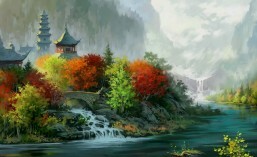 Well, that and the hope that the world-building potential might just solidify into something decent. What finally made me bump my rating down to just two stars was the cliff hanger ending. It was pointless that a completely new plot line opened up and was tacked on to the the end of the book. Why do some authors seem to think that they this is the way to make sure readers purchase their next book? Isn’t just simply writing a compelling story enough???? This tactic so annoys me that if I had not already received a free advance review copy of the next book I would drop the series cold. As it stands, this series has two outs with no one on base. We’ll see if the third books strikes out. **Disclaimer: Reviewer was provided with a digital advance review copy of this book by the publisher via Net Galley. Description: Born the only female in an all male race, Jessica McClain isn’t just different—she’s feared. After living under the radar for the last twenty-six years, Jessica is thrust unexpectedly into her first change, a full ten years late. She wakes up and finds she’s in the middle of a storm. Now that she’s become the only female full-blooded werewolf in town, the supernatural world is already clamoring to take a bite out of her and her new Pack must rise up and protect her. But not everyone is on board. The werewolf Rights of Laws is missing text and the superstitious werewolves think that Jessica means an end to their race. It doesn’t help when Jessica begins to realize she’s more. She can change partway and hold her form, and speak directly to her wolf. But the biggest complication by far is that her alpha father can’t control her like he can the rest of his wolves. When a mercenary who’s been hired by the vampires shows up to extract information about the newly turned werewolf only days after her change, they find themselves smack in the middle of a war and there’s no choice but to run together. When it’s up to Jessica to negotiate her release against her father’s direct orders, she chooses to take an offer for help instead. In exchange, Jessica must now swear an oath she may end up repaying with her life. 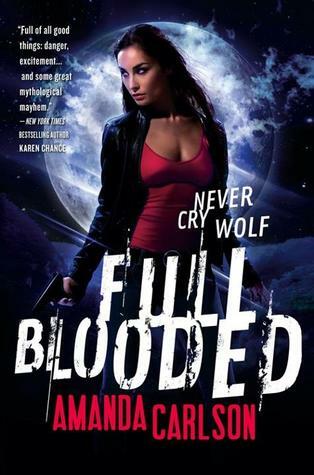 Review: I am a sucker for a good cover and I have to admit that the cover of Full Blooded sucked me in. The cover features a striking, but fierce looking female who is ready to take on the world. Just what I like in my urban fantasy! I won’t lie; the story did not live up to the promise of the cover for me. It is not a bad story. In fact, the concept is great. The plot builds on the mythology that Jessica is the first of her kind, a FEMALE werewolf. This is a game-changer in the supernatural world, especially in light of some vague, threatening, and apparently lost prophecies. Jessica is a strong minded independent young woman trying to cope. However, she can be really whiny, which I found annoying, almost as annoying as her tendency to leap before looking. She KNOWS she has gaps in knowledge, yet she seems to have no interest at all in actually spending some time learning. I guess we can forgive Jessica a little bit, considering the fact that everyone in her life is equally stupid. It made absolutely no sense that everyone kept trying to keep her in the dark regarding werewolf lore. I suspect this was the author’s attempt at creating a situation ripe for conflict. Unfortunately for me, this type of weak plot device turns me right off. I also felt that the author tried to cram too much into one book. It would have been different if all of the plots and subplots had been handled well, but they all felt short-changed. I think the book would have been much stronger if the story focused on the local pack intrigue with well-executed story development. Finally, the abrupt ending made me want to throw the book across the room. Lucky for my Kindle, I was able to restrain myself. What is with the trend toward unfinished stories???? I feel cheated. I bought a complete book, but it wasn’t. Grrr. There was just enough of a glimmer that I will give the next book a shot. It helps that I’ve been approved for a no cost advanced review copy. If I had to shell out money, my journey with Jessica would like end here. Fingers crossed that this series gets better.